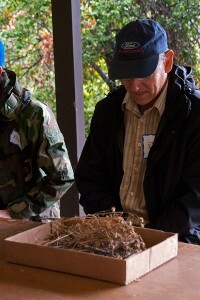 This past Saturday BFS Volunteers braved a rainy day to help with something different at the BFS. 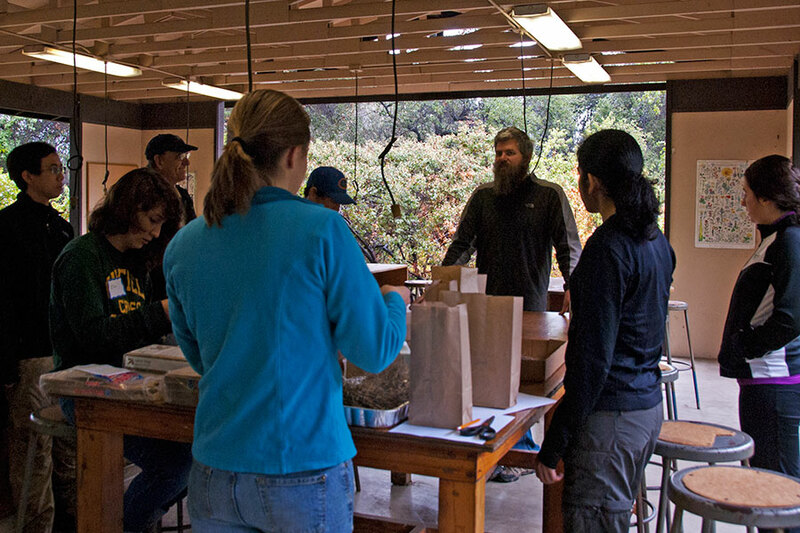 Instead of clearing trails or removing weeds, they helped with a BFS research project being carried out by Harvey Mudd senior Megan Wheeler. Megan is comparing carbon storage in the native coastal sage scrub and the east field, which is vegetated mainly by non-native invasive grasses. Any carbon that is stored in soil and vegetation is not being released into the atmosphere to contribute to global warming, so understanding how disturbance (such as displacement of native sage scrub with exotic grasses) affects carbon storage is an important – yet poorly understood – factor in modeling climate change. Megan Wheeler (bright blue jacket) and volunteers listen as BFS Director Marty Meyer explains the carbon storage research project. ©Nancy Hamlett. Megan has 24 plots in three habitats – intact coastal sage scrub, grassland, and recovering coastal sage scrub – and 3 subsamples from each of these plots, for a total of 72 samples. 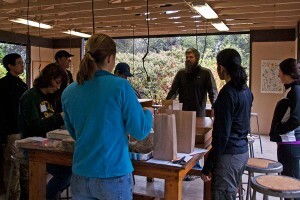 In each of these, she is analyzing carbon stored in above-ground biomass, below-ground biomass, and litter – which is where the volunteers came in. 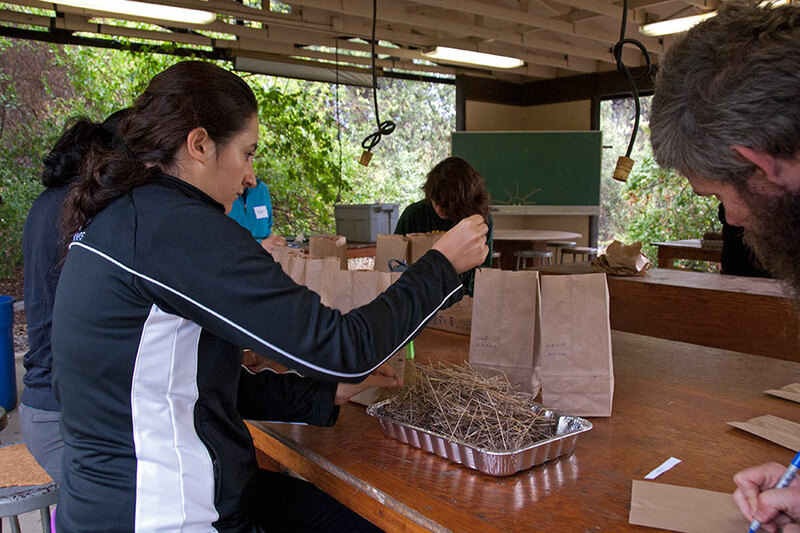 The litter from each of the 72 samples needs to be sorted into wood, grasses, broad non-grass leaves, and small fragments of Artemisia and other material. This is clearly a task that could use a lot of hands! Caroline Nielsen (HMC ’16) sorts litter from her tray. All that came from just 0.1 m2! ©Nancy Hamlett. The litter samples were dumped into trays, then sorted into paper bags – one for each category of litter. 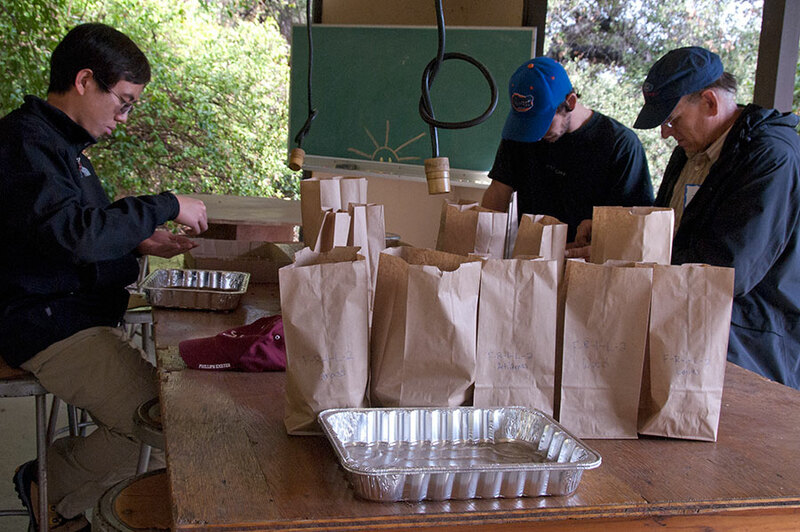 Bags and an empty tray await litter sorting while Michael Lertvilai (HMC ’16), Elliott Cox, and Tim Cox sort their bags of litter. ©Nancy Hamlett. We got an excellent demonstration of the patchiness of natural habitats. One of Tim Cox’s samples was full of our old friends, Maltese Star Thistles, plus a generous supply of rabbit poop. Tim Cox contemplates his trayful of Maltese Star Thistles. ©Nancy Hamlett. Caroline Nielsen (HMC ’16) sorts, while Thendral Govindaraj (HMC ’16) gets advice from Megan Wheeler (HMC ’13). 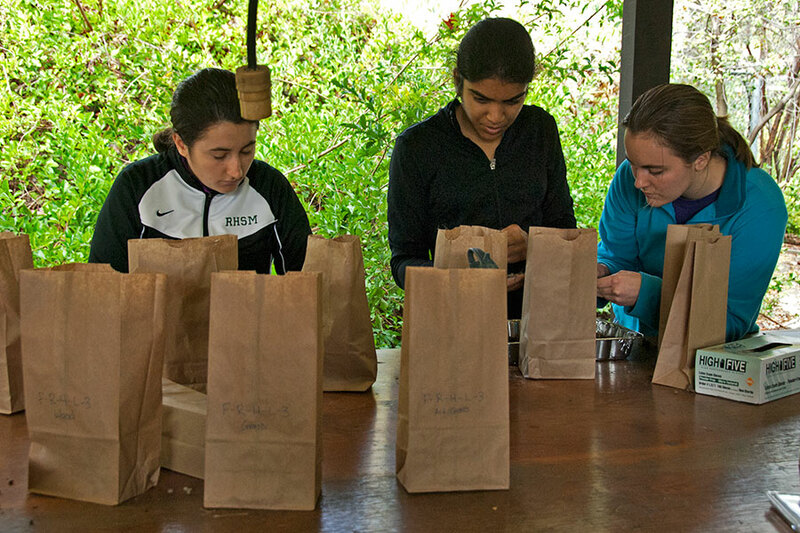 Three sorted bags from sample F-R-4-L-3 are in the foreground. ©Nancy Hamlett. This was the perfect activity for a rainy day! 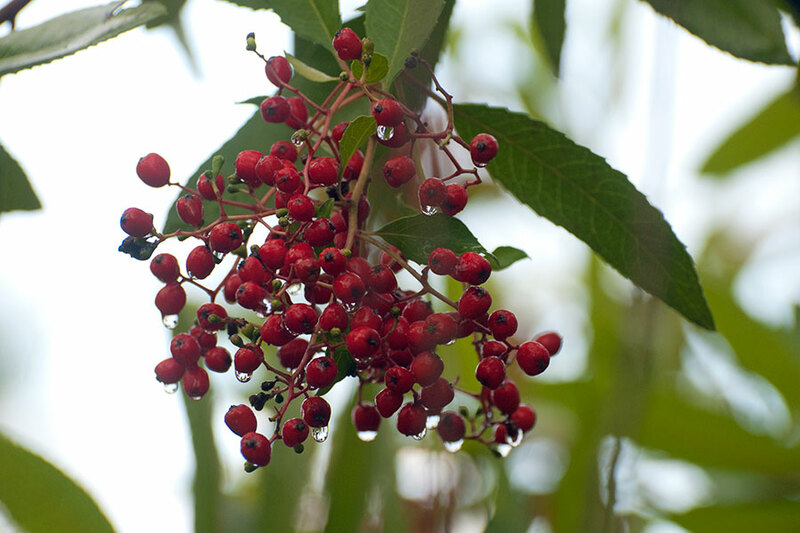 Raindrops on Toyon berries. ©Nancy Hamlett. We hope that BFS volunteers can help with more BFS research projects in the future. For a schedule of upcoming volunteer activities, please check our volunteer page.